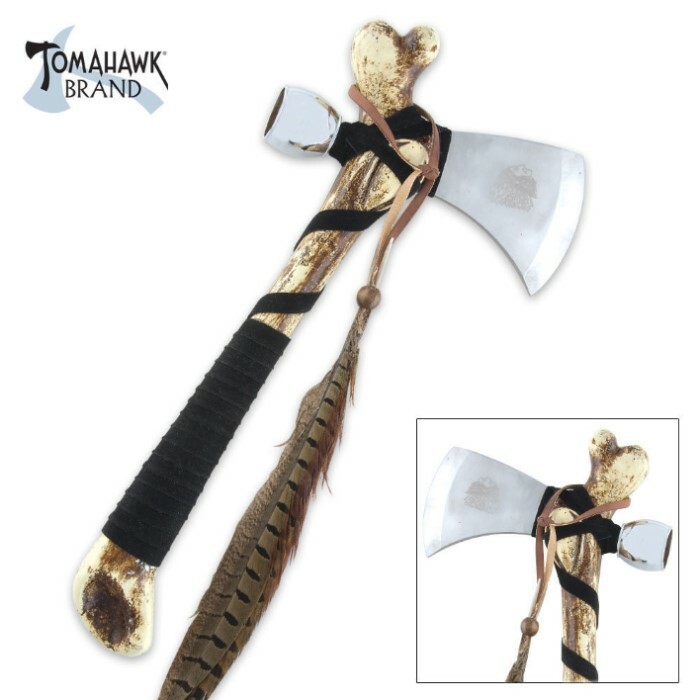 Become an Indian Outlaw with this Cherokee Bone Handle Peace Pipe Tomahawk. This replica features leather wrappings and feather accents, and a sharpened stainless steel head. I always read the description as well as the reviews. It clearly states that the pipe is for display purposes only. Check it out below, I copied n pasted the description: Sharpened stainless steel blade Leather-wrapped faux bone handle Pipe for display purposes only Overall length: 12 1/2" I wanted it for both the tomahawk and pipe but it's just decorative, so I'll get something else. I'm giving it 5 starts because it's accurate to the description. It looks cool and it doesnt seem like it's gonna fall apart anytime soon, i only gave it three stars cause unless im missing something the actual pipe dosent work, which is like half the reason i bought it. The picture looks better than it really is the pipe don't work it came dull it is a good heavy piece just hang it on the wall that's all it's good for to look at Buy it if you want something to hang on your wall.